Far-left MP Jeremy Corbyn could in theory be the next British PM; called Hezbollah and Hamas 'our friends', supports Raed Salah. A far-left British politician who invited Hezbollah and Hamas terrorists to the Houses of Parliament is among four UK Labor Party MPs vying for leadership of the party. MP Jeremy Corbyn - a longtime anti-Israel activist and patron of the extremist Palestine Solidarity Campaign - was the last of the candidates to announce his intention to run as party leader Monday, securing the required 35 MPs' endorsement just two minutes before yesterday's noon deadline. Corbyn is not a front runner, but he is the preferred candidate of the hard-left within Labor, and particularly many among the powerful trade unions - whose votes provided key in the surprise victory by former party head Ed Miliband. Miliband's resignation following Labor's electoral defeat in May trigger the new leadership race. Corbyn's extremist views have already come in for scrutiny, however, in particular his support for extremist Islamists and even terrorist organizations. In particular, in 2009 he invited delegates from both Hamas and Hezbollah - both of whose "armed wings" are proscribed terrorist groups in the UK - to address supporters inside the Houses of Parliament. A day earlier at a meeting of activists from the radical "Stop The War Coalition" - a movement he chairs - Corbyn proudly announced: "Tomorrow evening it will be my pleasure and my honor to host an event in parliament where our friends from Hezbollah will be speaking." "I also invited our friends from Hamas to come and speak as well," he continued, but said that "unfortunately the Israelis would not allow them to travel here, so it's going to be only friends from Hezbollah." "So far as I'm concerned that is absolutely the right function of using parliamentary facilities, to invite people from others parts of the world," he declared to enthusiastic applause. 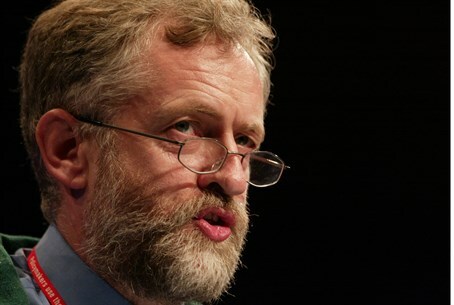 Hamas and Hezbollah are not the only distinctly un-liberal groups Corbyn has supported. In 2012 he hosted a talk by Mousa Abu Maria, an Islamic Jihad member who spent several years in an Israeli prison for terrorist activities. More notably, he has been a vocal supporter of the anti-Semitic head of the Israeli Islamic Movement's Northern Branch, Sheikh Ra'ed Salah. Salah has been convicted several times on charges of incitement, and is a regular purvayor of anti-Semitic conspiracy theories and stereotypes. Among many such incidents, just one month after the 9/11 World Trade Center attacks Salah wrote an article which promoted the view that the attack was in fact a Jewish conspiracy. "A suitable way was found to warn the 4,000 Jews who work every day at the Twin Towers to be absent from their work on September 11, 2001, and this is really what happened!" he wrote in the Sawt al-Haq w’al-Huriyya (Voice of Justice and Freedom) weekly paper. "Were 4,000 Jewish clerks absent by chance, or was there another reason? At the same time, no such warning reached the 2,000 Muslims who worked every day in the Twin Towers, and therefore there were hundreds of Muslim victims." During a speech at a 2007 demonstration he infamously accused Jews of using children's blood to bake blood, invoking the medieval blood libels used to trigger murderous pogroms in both Europe and the Middle East. He also called for a "third intifada" over Israeli plans to excavate near the Temple Mount. Salah also spent a brief period in jail for transferring money to Hamas, and famously "reminisced" fondly over the drawing of swastikas as a child, in a 2009 interview with a London-based Arabic language TV station. He has also been jailed for taking part in violent riots, and branded homosexuality a "great crime." But Corbyn has been outspoken in Salah's defense, praising him as "a very honored citizen," and stating that he is "far from a dangerous man." He also insisted that Salah's "voice must be heard" in 2012, after Salah was barred from entering the UK due to his extremism. Corbyn's vocal support for violent anti-Semites is particularly worrying given that, if he wins the party leadership vote, he could end up being the next British prime minister, or head of the opposition. His candidacy will do little to encourage Britain's Jewish community, which - still reeling from a spike in anti-Semitism over the past year - has largely abandoned Labor in favor of the center-right Conservatives due to the leftist party's increasingly anti-Israel bent.